The Swartland Canoe Marathon (doubling as the 2011 S.A. K1 River Marathon Championships) was held on Friday 17th and Saturday 18th June, during a “window” of good weather (north west gale force wind, rain and a cold front for the 2 days before the event and the day after – how’s that for timing?) which saw a full Berg River flowing at 35 cumecs at the start (Skooltjie, Wellington), ending at approximately 44 cumecs and 39km later at Zonquasdrift (end of Day 1), and at the start of Day 2, flowing at 40 cumecs and ending at 42 cumecs, 46km later at Bridgetown (end of Day 2). This on a river that the previous weekend was flowing at 8 cumecs! So, not only did the organizers get the weather for this event right on the button. (Day 1 was alternatively overcast and sunny, and Day 2, was brilliant with blue skies and sunshine the whole day), but they also had very good and safe conditions on the river thanks to the hard work from PCC together with other local canoe clubs in clearing invasive alien trees which were blocking sections of the river. Day 1 of the 2011 Swartland Canoe Marathon dawned cold and with scattered cloud but as it was windless, it made for perfect racing conditions. The race started at 10h00 sharp, with seeded batches of five rows of five paddlers each, each released at five-minute intervals, until all 255 entrants (including sweeps) were away on the fast flowing stream. Up front, there was a racing frenzy as the ‘who’s who’ of South African river paddling made the charge, which was not easy in the swirling, whirlpooling waters of the swiftly flowing Berg and in Klei Rapid, there was near disaster as paddles clashed and canoes bumped into each other as some 6 to 8 racing paddlers strained every sinew to stay upright and in racing mode. By the Grensplaas “turn-off” (the big left hander in the river that takes paddlers past Grensplaas and Zeekoegat), the leading bunch was down to 5 paddlers – Hank McGregor (Kingfisher Canoe Club, Durban) and the 2009 winner of the Swartland; Lance King (Milnerton), the Western Cape’s leading K1 paddler at the moment; Graeme Solomon (Peninsula Canoe Club), a past Swartland Champion; Matie Pierre-Andre Rabie, the 2010 Swartland Champion and Junior and U23 National Marathon paddler; and Heinrich Schloms (Paarl Canoe Club), a Senior National paddler from 2010. These 5 played follow-the-leader through the slalom-like ‘forest’ to Hermon Bridge when Rabie having fell off to join the chasing bunch of Edgar Boehm jnr. (PCC), Robbie Herreveld (Dab), Jacques Theron (Dab) and Brandon van der Walt (UKN) – just look at those names, legendary canoeist all – and with 15 kms to go, simply maintained the classic racing bunch of 4 canoes all the way to Zonquasdrift. 200m from the Day 1 finishing line, there was a rope stretched low across the river which caused some consternation, but McGregor, timing things to perfection, outsprinted King and Solomon to win in 2 hours 28 minutes 26 seconds. In the Senior Women’s race, it all came down to 2 paddlers – Matie Civil Engineering student Robyn Kime and the Eastern Cape’s Olympian and world rated surf ski paddler, Michelle Eray, who paddled together for the whole day, Eray taking line honours at Zonquasdrift one second ahead of Kime, in 2 hours 44 minutes 27 seconds. The 3rd woman home was Natal’s Hilary Pitchford closely followed by a paddler who elicited great interested when she entered – PCC’s Jean Wilson, a former National marathon paddler who is making a comeback after taking time out to start a family a family. And so the afternoon continued, with tired but exhilarated paddlers reaching Zonquasdrift for an ice-cold Hansa, handed out by the gorgeous ‘Hansa Girls’ and a delicious lunch catered for by the local Riebeek Kasteel Primary School, UCT Physiotherapy students provided massages to help ease stiff and sore muscles whilst the sun warmed those who chose to sit in the open and swap war stories about the day’s paddle. That evening, the now famous “Swartland Shindig”, (sponsored by Hansa) got off to a roaring start at about 18h00 with a live band belting out hits of the ’70s, ’80s and ’90s, whilst the traditional raffle “where anyone can be a winner” went down a treat, many magnificent prizes being won by paddlers through the excellent system of drawing up preliminary winners and then putting them through their paces à la “Who Wants to be a Millionaire” by expert host, PCC’s Georges Willis. With every question being related to the race, canoeing and the Swartland area in general (and not a single trick question amongst them! ), it made for an often hilarious and at all times, entertaining, show that, along with the excellent fare on sale, made for a wonderful evening. U18 paddler, Danie Botes from the Centurion Club, won the Knysna Racing Kayaks K1, whilst Angie (Gaffney) Austin, much to hubby Jean’s delight, won a year’s supply of Hansa!! Day 2 dawned as perfect a day as can be experienced in the Western Cape winter – no wind, clear blue skies and crisp clear air that made it seem like the mountains across the valley could be touched if one simply stretched out one’s arm. The race started at 08h30, when the early morning mist was still rising off the water, with the male and female paddlers from Day 1 being sent off in elapsed time. The other paddlers departed from the Zonquasdrift Bridge in batches of 25 at five-minute intervals, beginning at 09h00. With a mere 6 seconds having separated the top 4 paddlers (McGregor, King, Solomon and Schloms) on Day 1, they soon formed up into the classic racing bunch and this continued through the 46km distance to Bridgetown, with Schloms only falling off over the final few hundred metres, McGregor again took the line in a sprint finish from King (by 4/100ths of a second! ), while Solomon fell off the slip to come in 9 seconds off the pace. McGregor won Day 2 in 3 hours 48.81 seconds and regained his Swartland title with an excellent overall time of 5 hours 29 minutes and 15 seconds. In the women’s division, Michelle Eray and Robyn Kime matched strokes for most of Day 2, but Kime, by her own admission, was off her usual paddling fitness at this time of the year (not surprising being a final year CivEng student and having just been through a 3 week exam period!) and Eray got away from her after Train Bridge to take line honours over the 46km section by 4 minutes, giving the East Cape paddler the 2011 Swartland Women’s title in the overall time of 6 hours 4 minutes and 23 seconds. But the drama didn’t end there, as Jean Wilson gave Hilary Pitchford a good go to end up taking 3rd spot over all from the Natal woman by just on a minute and a half in the not too shabby overall time of 6 hours 33 minutes 31 seconds. Jean back on the podium after an absence of probably the better part of 8 years was a good sight for all paddlers to see and, together with her worthy opponents, Eray and Kime, drew terrific applause from the crowd at the prize giving. As the 2011 Swartland Canoe Marathon doubled as the 2011 S.A. K1 River Marathon Championships, this year’s SA Champions are Hank McGregor (from KZN) and Michelle Eray (from the Eastern Cape). Not only was the event outstanding, but Peninsula Canoe Club took a brave stance and made a decision to address some Social Development issues by creating an initiative to cover the financing and logistical organisation of improving the quality of life for pupils at the small Bergrivier Primary School situated at a very rural spot at the start of the race and known to the paddling fraternity as “Skooltjie”. By “adopting” this school as their own cause célèbre, Peninsula Canoe Club knew they could make a difference in some kids’ lives and demonstrate to the local community that paddlers are people who are happy to be “giving back” to them. As they had already committed to helping the school, the organizers decided also to investigate hiring the use of their toilets. When they went to inspect the toilets in the ablution block, what they found was quite disturbing. The toilets were in a shocking state – some were cracked or broken, they were all completely blocked, and who knows how the kids were managing. Peninsula Canoe Club then agreed with the school that they would repair and upgrade the toilets and proceeded to do so (at a cost vastly exceeding what would have been paid to hire fancy portable toilets). Part of the problem lay in the water supply to the toilets – it was pumped directly out of the Berg River into a holding tank and the pump was out of action. When enquiring about the drinking water at the school, the organizers were horrified to discover that the supply of water out of the Berg River is the only supply to the school and the children are presumably expected to drink this. Paddlers are all well aware of the quality of the water in this section of the Berg River. At times, the river upstream of here seems to be little more than a glorified sewer, particularly in the area just downstream of Wellington, after it has passed the Paarl sewerage works, the Mbekweni informal settlement and an industrial area. This is an on-going project, and funding is still required for the final connection between the two pipelines. The District Municipality requires a deposit of R12,000 to install a meter. (You’d think that somehow local government would find a way to cover this cost.) In the meantime, the pump has been repaired so water from the river continues to be used until the necessary funds can be raised. So this tiny school, so long on the map for Berg River paddlers as one of the noticeable landmarks on the river, looks towards a much healthier future as an Outreach programme of the Peninsula Canoe Club. Full credit must be given to the organising committee of the Swartland Canoe Marathon (hosted by Peninsula Canoe Club) for treating the 255 entrants to an event that must surely become a benchmark of superb canoe race organization. 2011 Swartland K1 Marathon/S.A. K1 Canoe River Championships, 17th/18th June. Ernest van Riet, Maties, 5:48:01. Day 2 of the 2 day, 91 km Men’s Health Swartland Canoe Marathon, begin with a slightly smaller field than day 2 (some 20 paddlers were unable to make the start having either failed to have made the cut-off on day one at the Hermon Bridge, or had damaged their canoes so severely, they were unable to continue their race), but in (again) perfect weather – blue skies, no wind and intially, almost warm, as the threatening cold front predicted, held off until afer the race and the prize-giving, much to the relief of the organizers. The top 17 paddlers got away from Zonquasdrift (racing the 48 kms to Bridgetown) on an elapsed start, with Lance King (MIL – the Day 1 winner) leading the pack, Pierre-Andre Rabie (US) and Paul Marais (PEN) being on his wave, as they were at the end of the 43 km day 1 section. Included in the elapsed group was the leading lady, Abbey Miedema (PEN), who had recorded an excellent 17th postion on day 1, totally dominating the ladies section of the race. Unlike day 1, (the 43 km section from Wellington to Zonquasdrift), the 48 km day section, from Zonquasdrift to Bridgetown did not have the umpteen tree blocks, rather featuring a lot more open water, which meant faster times and greater opportunity to slip-ride and this showed in the final times. (PRL) 7th, Edgar Boehm (jnr) (PEN) 8th, Tom Schilperoot (PEN) 9th and Nick Longley (PEN) 10th. There was another outstanding performance by Grandmaster, Roelof van Riet (MIL), who posted 22nd place overall. This 60 year old, a canoeing legend in South Africa and indeed internationally, was 54 minutes behind the winning boat of Lance King, someone who is 40 years his junior, and in doing so beat the majority of the field, when many of his non-paddling contemporaries are probably sititng around in their slippers watching the world go by. It is the likes of van Riet and other paddling legends like Andre’ Collins, also in his 60th year and due to enter his 39th Berg River Canoe Marathon, that have a story to tell about the benefits of this sport where health, wellness and fun can be had way past those years when society tends to write them off as ‘seniors’. So ended the 2nd annual Men’s Health Swartland Canoe Marathon – on a high note – and it was without a doubt a succesful, if not tough event. 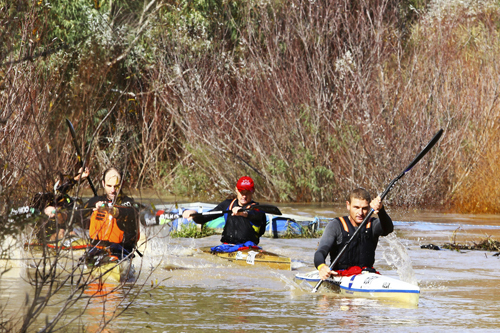 Those paddlers who used this race as training for the fortchoming Berg River Canoe Marathon (9 – 12 July), will be under no misapprehensions of the toughness and difficulties of that race, especially if the river remains low and the trees blocks and narrowings in the higher sections (Paarl to Gouda Bridge) remain in place as it was this immediate past week. The 2nd Annual Men’s Health Swartland Canoe Marathon, got off to a good start this morning in perfect weather – cloudless sky and no wind, but on a low river which as to play havoc with most of the paddlers but which ended in a sprint finish between race favourite, Milnerton’s under 21 star, Lance King and another Under 21 paddler, the Matie’s Pierre-Andre Rabie, and Peninsula Canoe Clubs Sub Veteran, Paul Marais, some 3 hours and 8 minutes later. The race started approx. 200 m below the famous Skooltjie landmark on the Berge River at 10h00 this morning, when Peninsula Canoe Club Chairman, Mark Torrington ‘fired’ the gun to see some 130 paddlers take on what is the better part of the first day of the famous Berg River canoe marathons. An early casualty was PC.C’s Greg Barnard who snapped a rudder cable some 800 meters after the start, but this in no way deterred the better part of the top 12 paddlers who were locked in combat until the Berg’s one and only rapid – Klei Rapid, when King, Gavin White (Mil), Ernest van Riet (US), Tom Schilperoot (PCC), Edgar Boehm (jnr) Ian Trautmann (PCC), Paul Marais (PCC) and P-W Basson (Paarl) managed to breakaway. Tracking through the narrow channels, this group led the field, changing the lead as obstacles presented themselves. Shortly after Grensplaas , at The Ribs, van Riet and White made their break but were caught by King and Paul Marais (PCC) at a tree block shortly after Grensplaas. Through the trees, the tree blocks and tree ramps, these 4 continued to lead the field with White dropping off before Roostuin allowing van Riet, King and Marais to dominate. At a huge tree block just before the Hermon Bridge, the field came together again, this time with Pierre-Andre Rabie (US) catching up. Van Riet sank at the Hermon weir (he was paddling with his splashcover off) allowing Marais, King and Rabie to take the fore on the final 15 ks from Hermon to Zonquasdrift. And so it remained until about 15 minutes from the end, when, at a narrowing caused by a fallen tree, King and Rabie managed to shake off Marais, but he made a huge charge, catching the leading two, to have day one end as a flat sprint across the line, 1 sec separating each canoe. In the ladies section, Abbey Miedema (PCC) was in a class of her own and had to rely on top men for competition to come through in 17th position overall and only some 20 minutes behind Lance King, which on a narrow, low and tree choked river was an excellent day ‘at the office’ for her . The 2nd lady home was Lisa Scott (MIL) and 3rd was Janet Vorster (PCC). Paddlers and 2nds were again treated to the sight of one of the legends of canoeing in South Africa, Grandmaster, Roelof van Riet, in full flight, as he registered 21st position overall in the excellent time of 3 hours and 34 minutes. Again it was interesting to note who the top paddlers home were today – 1st, 2nd and 4th were all Under 21 paddlers, which bodes well for the future and in 3 position, Paul Marais, now a Sub-Veteran showed his class – the question previously asked, was where are all the senior men? The answer is that they placed from 5th to 9th so we look forward to a resurgence of the seniors tomorrow and in the following W.C.C.U. races this season. Tomorrow’s section, Zonquasdrift to Bridgetown is 48 ks, 5 further than today, and constitutes the full second day of the Berg River Canoe Marathon, which, from Gouda Bridge onwards, shouldn’t have as many tree blocks as today and so it is envisaged that it will be a battle royal up-front as it will be back to the basics of canoe racing – hard paddling, tactical moves and sharp eyes. For John Hayes of Dabulamanzi Canoe Club, Saturday 23 June will go down as a lucky day. As a competitor on the Men’s Health Swartland Canoe Marathon he could hardly have been luckier. Paddling along on day one of the event between Hermon farm and Hermon bridge, a gale force north westerly wind started gusting. With what sounded like a rifle shot a 25 m high gum tree fell on to him, boat paddle and all. That’s when his luck began to change. Realising the danger of the situation, and that John was possibly trapped in a strainer André feared for the worst. and that’s when John’s guardian angel came to the rescue. He popped up between the branches almost totally unscathed apart from a few scratches and a considerable shock. Of the boat and paddle there was no sign and they are unlikely to be recovered until the winter rains abate and the river level drops substantially and even then only pieces of fibreglass are expected. That was John’s lucky escape number one. The organisers of the race had been given a new Knysna Racing K1 by sponsors Brian’s Kayak’s as a lucky draw prize. After a quick consultation with the sponsor and a few paddlers it was decided to give the boat to John as it was unlikely that there was anyone on the race more deserving of it. This was John’s second stroke of luck. Later in the evening, a paddle sponsored by ORKA paddles, was given away as another lucky draw prize. Five names were initially drawn, and John’s was among them. The draw proceeded on the basis that each paddler would pull a name from the hat and the person named would be eliminated. Three unlucky paddlers took their seats. John Hayes and Kevin Bouwer were left. The next name out of the hat was John’s which left Kevin with the paddle. Kevin took the microphone and said “I’m giving this paddle to John”, lucky break number three! The same wind storm caused havoc further down the river, and when Peter Cole and Andrew Ross, who were paddling ahead of the field erecting direction arrows and generally making sure that the river was clear, got just beyond Gouda Bridge on the second day of the race, they found the river blocked by another massive tree that had fallen since Friday. Peter said, “We have done quite a lot of cutting, over the past three weeks, with the chainsaws donated to the club by Cutters, in preparation for the race, but this was the biggest we encountered.” It took them 45 minutes just to cut a narrow channel for the paddlers to get through. The arrows were generally well received, apart from a few top paddlers who felt that it negated the advantage of tripping. For the majority it however levelled the playing field with the Capies even revealing some of their favourite sneaks! At the end of the Men’s Health Swartland Canoe Marathon Graeme Solomon, a former Isuzu Berg River marathon winner, of the host club Peninsula, held off a determined challenge from second placed and first under 21 paddler, Lance King from Milnerton Canoe Club who finished the two day race over 87Kms a scant 56/100 seconds. The river flow picked up considerably at the confluence with the Klein Berg, while the rain held offuntil the finish. The two paddlers stayed and worked together to extend their first day lead over third placed Berg River Marathon veteran Donnie Malherbe who overtook 4th placed Sven Bruss, from Kwa-Zulu Natal early in the day. Jonathan Niemann was 5th. Paul Marais took 6th from Heinrich Sloms, Martin Dreyer and Edgar Boehm who finished 7th, 8th and 9th respectively for the Western Cape while Soweto Canoe Club coach, Ryno Amdorff rounded out the top 10. The leading junior paddler, paddling in the under 18 category was the young Pierre Andre Rabie of Paarl who was in an incredible 14th place overall wrapped his boat after catching up Martin Dreyer. Brett Dorman of Milnerton canoe club won the class while Pierre-Andre was forced to the bank to make running repairs before a storming paddle to salvage the 2nd junior position, from Sean Rice. At the end of the first day of the Men’s Health Swartland Canoe Marathon Graeme Solomon, a former Isuzu Berg River marathon winner, of the host club Peninsula, held a slender 1 second lead from second placed and leading under 21 paddler, Lance King. In third place was Kwa-Zulu Natal paddler Sven Bruss, 1 minute 20 seconds behind King. These three, together with eventual 5th placed Jonathon Niemann of Gauteng paddled together for most of the 43kms first day of the race. Sven said “I was on Solomon’s outside and pulled too close to a tree, as I leaned to get myself away I took some water into the boat”. A visibly upset Bruss continued “The next half an hour was spent pumping water and watching them disappear”. In the Ladies race Alexa Lombard, of Peninsula Canoe Club, crossed the line 2 seconds ahead of Abbey Miedema paddling in the colours of the Harmony Club. The two spent the day in each others company although Abbey conceded, “I had to play catch up a few times”. She said “ With the separate ladies start it is lonely with only the two of us in the front, I would really prefer to be seeded with the men and take my chances, at least until there are a few more girls able to keep up the pace at the front”. 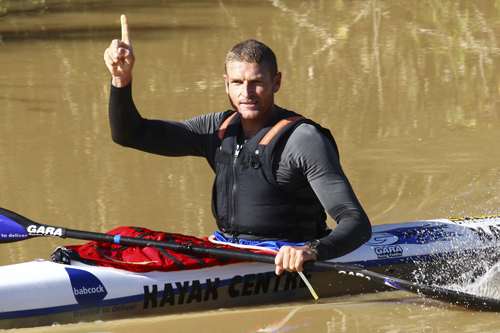 Veteran paddler and Berg River specialist Donnie Malherbe took 4th place overall. Heinrich Sloms, Paul Marais and Ernst van Riet took 6th, 7th and 8th for the Western Cape while Soweto Canoe Club coach, Ryno Amdorff and Harmony’s Martin Dreyer rounded out the top 10. The first junior paddler, paddling in the under 18 category was the young Pierre Andre Rabie of Paarl in an incredible 14th place overall seven and a half minutes ahead of second placed junior Brett Dorman of Milnerton canoe club. With the last 10 k’s of the race run into a strong headwind from the North West and cloud scudding in, heralding a major incoming cold front, tomorrow is set for a challenging day. While the weather may be cold the racing is expected to be red hot!